If you find yourself waking up many winter mornings with a stuffy nose or parched or tickly throat, you don't necessarily have a cold. More than likely, the air in the room is too dry. Enter ... humidifiers. These great devices have many benefits. As a humidifier puts much-needed moisture back into the air, it can help alleviate that stuffy nose caused by artificial heat. It can even lessen or eliminate nosebleeds caused by the dryness in the air. A humidifier can ease cold symptoms through flu season. It can moisten dry skin and greatly help to lessen the symptoms of such skin conditions as psoriasis and eczema. A humidifier can even save you money by keeping personal belongings from fading, and by adding humidity in colder months which makes your home feel warmer. This added warmth enables you to turn down the thermostat while keeping your home just as warm as before. Humidifiers are simple and yet complex, as the electronic components inside including capacitors, resistors, etc., can make your head spin. But if you're looking to purchase one to make your home more comfortable, here's some basic information on how humidifiers work and what type would be best for your needs. Simply put, a humidifier is a device used to increase the amount of water vapor in the air of any room or building, consisting of a container for the water as well as a vaporizer. Any humidifier uses a control that can sense the amount of humidity in a room. This control cycles the humidifier on and off. As it senses dryness, the humidifier's water panel adds water vapor to the circulated air when necessary. In order to learn more about the technology behind them, it is necessary to discuss some of the most popular types of humidifiers. Steam, or 'vaporizer,' humidifiers are aptly named because they boil water and release steam into the room. Like all humidifiers, the steam version senses the humidity level in your home. It does this through an electronic component called a 'humidistat,' which is a humidifier's version of a thermostat. When this mechanism senses the humidity level is lower than the desired setting, it sends a signal to the humidifier to raise it. The steam humidifier turns on and off accordingly, and heats the water in a reservoir within in order to convert it to steam. When the water heats up and steam is created, the humidifier sends a signal to your furnace to turn to a low speed. The steam then enters the supply ductwork, pumping moisture into the room. When the humidity level is back at the desired setting, the humidifier eases up on the steam creation. Steam humidifiers utilize the simplest humidifier technology, and therefore, are the least expensive. Be careful around steam humidifiers, though, as the steam is very hot and can burn. The most elementary manner of humidifying a room is by placing a pan of water on a stove or radiator, which allows moisture to evaporate into the air. An evaporative humidifier works in much the same way, and is quite a bit more efficient at it. The most common evaporative humidifier utilizes a wick system, which uses a foam, paper, or cloth wick which draws water out of a reservoir inside. A fan blows over the wick to let the air absorb moisture. The higher the humidity in the room, the harder it is to evaporate water from the filter. This is why this type of humidifying system regulates itself. As the humidity increases, the evaporative humidifier's water vapor decreases naturally. 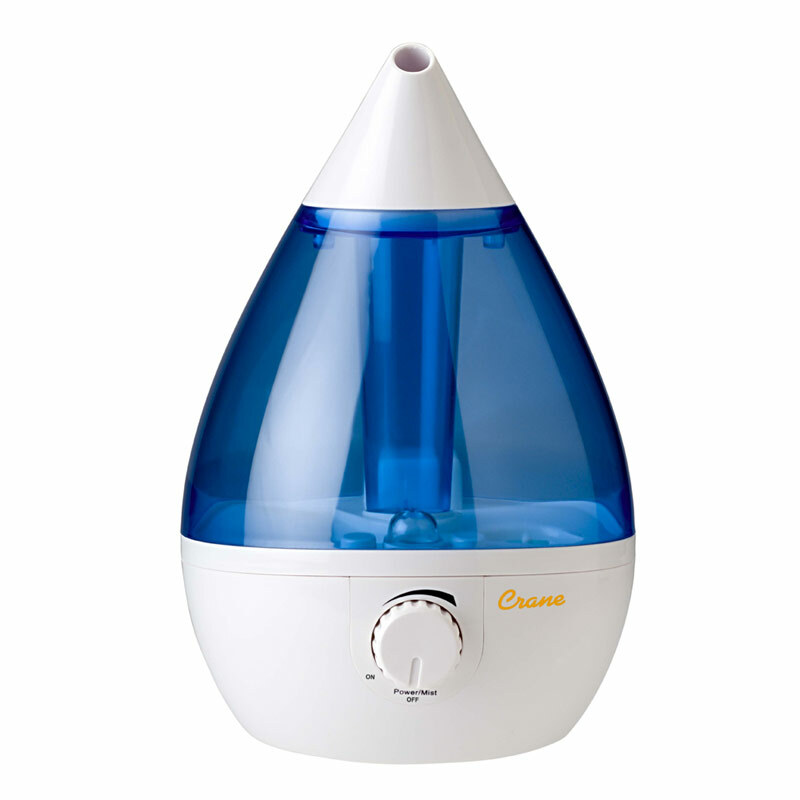 This type of humidifier is also very cost effective, and the units can come in large or even portable sizes. 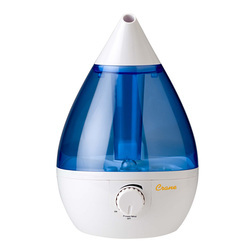 An ultrasonic humidifier uses sound vibrations in high frequencies to produce a very fine mist. A metal diaphragm vibrating an ultrasonic frequency creates water droplets or mist. This mist is then expelled, sending moisture into the dry room. An ultrasonic unit uses a transducer, which is the system that transmits the high-frequency sound vibration, or energy signal. Ultrasonic humidifiers are silent or make very little noise, and the mist they produce is cool, unlike a steam humidifier. This makes them safer to use. A humidifier is a great way to add moisture to the air in your home, enabling you and your family not only to feel much more comfortable, but to save money as well. Opting to install one or more humidifiers can make all the difference in the world, especially if you live in a dry environment.